Sean Kelly Gallery is delighted to announce the first ever-joint exhibition by two of the most influential artists of our times - Robert Mapplethorpe and Andy Warhol. Mapplethorpe / Warhol: Celebrity Portraits, is an opportunity to explore the two artists' parallel approaches through a genre, which was central to the work of both—portrait photography. There are striking similarities in the ways Warhol and Mapplethorpe approached the photographic image. The camera was an essential element in the making of Warhol's silkscreen paintings, and the photograph is well known as the basis for his appropriated Pop Culture images. 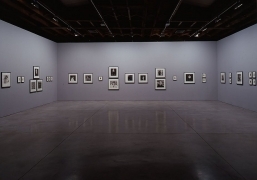 Nevertheless, the Polaroids in this exhibition, taken with the Big Shot camera in the 70s and 80s, were, as Peter Hay Halpert described, "unlike his other photographs...these reveal Warhol, the photographer, to a greater degree than we have recognized. Warhol's Polaroids are a personal statement in a way that none of his other photographs are. Where there is no artistry in the photo-booth pictures (a not undesired aspect), the Polaroids reveal Warhol behind the camera, making choices." Mapplethorpe, a great admirer of Warhol, also embraced appropriation in his first use of photography. 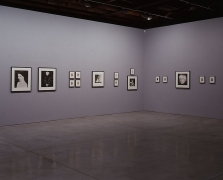 As demonstrated in the exhibition's 1972 portrait of Warhol, he began by appropriating commercially printed imagery, and it was not until the early 1970s that he took his first photographs with a Polaroid camera. Like Warhol, Mapplethorpe turned away from the world in which he grew up and became fascinated by the allure of New York City. Both artists enjoyed celebrity status in an audience beyond the art world, and both manipulated their personas as evidenced, in the exhibition, by each of their self-portraits in drag. While Warhol produced documents of celebrity and glamour, Mapplethorpe focused on the aesthetics of the body and his subjects' sexual presence. Mapplethorpe/Warhol Celebrity Portraits gives us the opportunity to juxtapose the artists' portraits of each other, as well as both artists' images of celebrities such as Grace Jones, Arnold Schwarzenegger, Keith Haring, Deborah Harry, Roy Lichtenstein, Francesco Clemente and Truman Capote.